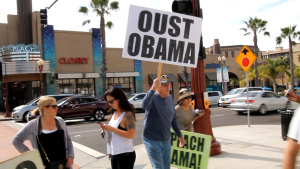 National Monthly Protest – Impeach Obama Now – April, 2015 (video) | Stop Obama Now!! This is a report of the national impeach Obama protest held in April. The suggested date of the protest is the 1st Saturday of every month. However, if it is not possible to have it on that date, photos and video of protest on other dates can be included as well. The concept is to grow step by step every month. The participants need to commit to protesting multiple months, so that this national protest will take off. We will publicize the results and recruit new organizers every month between protests. We need participants to also help spread the word recruit new people. If you are thinking about hosting a protest, contact me via the “contact” tab at the top of this page. Or, just leave a comment at the bottom of this page.